Is Phil Mickelson's Golf Swing Costing Him Tour Wins? Many golf analysts wonder why some of the better players don’t stand up to ‘challenge’ Tiger Woods, as if they were missing some strength of will. Measuring their swing mechanics, as described in our new book The Efficient Golfer, reveals that swing problems are holding them back, not lack of will. Phil Mickelson is a good example. 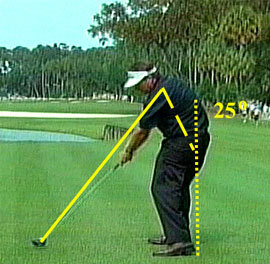 Here are some measurements of Phil’s alignment from down the line. The Spine Angle is the number of degrees you bend forward at address, the top of your backswing and at impact. 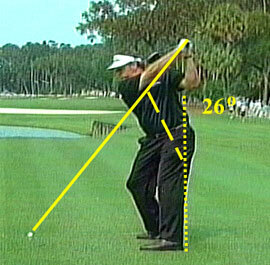 Here is Phil at address and at impact as seen at the 2007 Players Championship. At 38 degrees at address, Phil is outside of the average tour Spine Angle of 25-30 degrees. 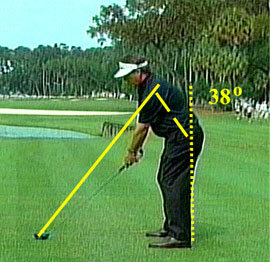 He changes his Spine Angle from 38 degrees to 25 degrees at impact, a change of 13 degrees. This is a 34% change that Phil has to manage every time he swings his driver. He makes this change because of the position of his hands at address. Phil ‘goes ballistic’ on his downswing. That is, he lets centrifugal force extend his club and arms. 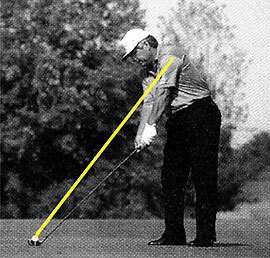 This extension increases the distance between his club head and his shoulders by 6-7 inches because his hands are dropped so far below his swing plane at address. He has to compensate for this increase in distance by ‘standing up’, or decreasing his Spine Angle. If he did not, his club would be 6-7 inches underground at impact. You can demonstrate this increase in distance by standing at your usual address position with your driver, and then bringing your hands up to your swing plane. 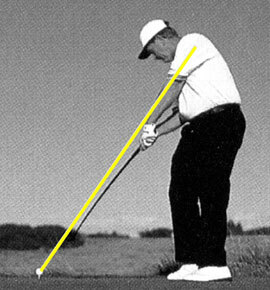 You will see your clubhead move forward 6-7 inches. 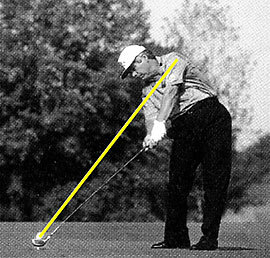 This change in Spine Angle makes it very difficult to strike the ball with the center of the clubface. You have to adjust your Spine Angle for each change in swing speed. It requires a lot of practice, and still makes it difficult to be accurate. Mickelson is 147th on tour in driver accuracy. Improving his alignment by keeping his Spine Angle more constant will improve his accuracy and make him more of a threat to Tiger. As with all golfers who drop their hands at address, Phil does not take his club back on plane, as you see in the first photo below. 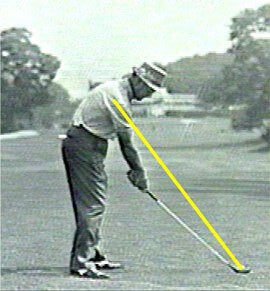 But he does manage to find the swing plane at the top of his backswing, and he brings the driver down close to the plane. You can see that Phil changes his Spine Angle while going back to prepare for his extension at impact. Finding the swing plane like this is not easy. It takes a lot of practice. Your hands and club are up behind you where you cannot see what is going on. But Phil does a good job (at least in this photo) and keeps his club close to the swing plane on his downswing. While ‘going ballistic’ makes ball contact more difficult, it does protect the golfer from the yips. Five years of research conducted for =The Efficient Golfer= revealed that well-known golfers who suffered from the yips (Snead, Hogan, and Trevino) compensated for centrifugal force on the downswing by gripping their driver and woods so hard that they did not allow the 100+ lbs. of centrifugal force generated by the club to extend their arms and club at impact. 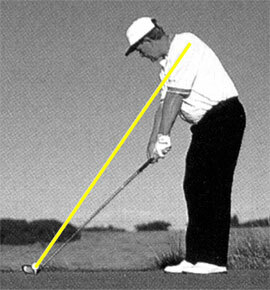 This strategy theoretically allows for better ball striking as the club returns close to the same position at impact as it was at address, and the golfer does not have to change his spine angle to compensate for the 6-7” increase in distance between the clubhead and shoulders that takes place when the golfer goes ‘ballistic’ and lets everything extend, as you see in the photos of Jack Nicklaus below. Nicklaus played for decades without ever developing the yips. He did not over-grip his driver, but rather let it extend at impact. 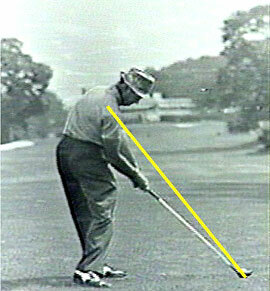 He was able to compensate for the change in his spine angle with superior hand-eye co-ordination. 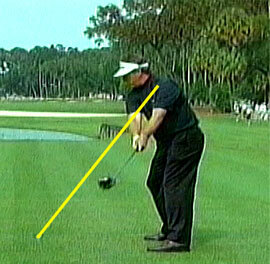 The photos below show Nicklaus at address and impact up the line. The fact that Phil is letting his driver extend, that he is not fighting centrifugal force in much the same way as Lee Trevino (by hyper-contracting his forearm muscles), tells us that he will be spared the yips. Less stress on the forearms with the woods and driver also contributes to his #22 ranking on tour in putts per round. Sergio Garcia and Tiger Woods both grip their drivers at impact to prevent any extension, and were ranked 178th and 137th in putts per round in 2006. Why does fighting centrifugal force cause yips? Whenever you overuse your muscles (and certainly fighting 100+ lbs. of centrifugal force with your small forearm muscles 100’s of times every day on the practice range constitutes overuse), you tear hundreds of the small fibers that make up each muscle. Part of the healing process is the formation of scar tissue in the muscles and in the connective tissues surrounding the muscles. This scar tissue, called microfibrosis, does not go away once the muscles have healed. In fact, these microfibers tend to accumulate over time, making golfers stiffer as they get older. We have also found that these microfibers bind tension into place, the tension that was necessary to fight the centrifugal force. When the golfer then has to very lightly grasp the putter, the muscles spasm, and the golfer yips his putt. Golfers who suffered from the yips, such as Bernhard Langer, have found that going to the long putter has enabled them to continue to play, although not very well. What Can Phil Do to Improve His Ballstriking? A simple solution is one recommended in =The Efficient Golfer=. Just bring his hands up to the swing plane at address. This would have two beneficial effects. 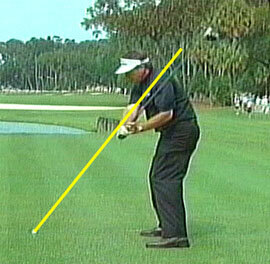 The first is that Phil could continue to let the club go ‘ballistic’ at impact and yet maintain a constant Spine Angle. 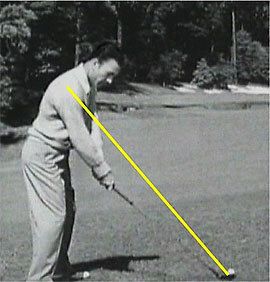 It would also tend to reduce his excessive Spine Angle at address. He would be more erect at address, most likely the same 25 degrees he now has at impact. 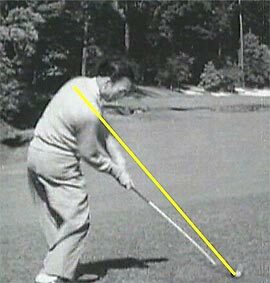 With his Spine Angle at address, at the top of his backswing, and at impact all being the same, he could greatly improve his accuracy off the tee. These drawing from =The Efficient Golfer= show what Phil would look like (if he were right handed) starting with his hands at address and maintaining a constant Spine Angle. It very difficult to make good ball contact when your spine is wandering all over the planet. Players with stable spine angles can make good ball contact without pounding hundreds of balls every day. One of the best amateur players we worked with, a plus 2 player, had a spine angle of 30 degrees at address, the top of his backswing, and at impact. Because of his busy work schedule (which required a lot of trans-Atlantic travel) he was never able to play more than every other week. He was rarely at the practice range. The second benefit of bringing his hands up to his swing plane at address is that he would be able to take his club and hands back on plane. This would make it easier for him to keep his club and hands on plane at the top of his backswing, and during his downswing. This would also improve his accuracy off the tee. These drawings show what his swing would look like (again, if he were right-handed). With his hands and club always on his swing plane and his spine angles constant, Phil Mickelson would be very hard for anyone to beat.